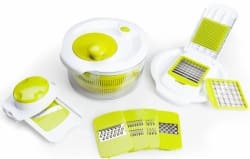 As one of its daily deals, 13 Deals offers this Salad Spinner Kit for $9.99 with free shipping. That's $2 under our mention from two weeks ago and the lowest price we've seen. (It's the best deal now by $20.) It includes a 5-quart bowl, salad spinner lid, and mandolin lid with seven different interchangeable stainless steel blades. Deal ends today.